The Single T quilt block is one of the easiest variations of the T quilting design. This patchwork Single T quilt block pattern explains how to sew the blocks quickly and accurately. At first glance, the Single T block seems a little ordinary, but you can create all sorts of dramatic layouts with the quilt blocks by varying their positions in a quilt. Combine T quilt blocks to ​make a scrap quilt or choose a specific color scheme for an entirely different look. How about dreamy floral fabrics in shades of rose and cream, with a neutral background and touches of green? Batik fabrics will work perfectly, too. The Capital T quilt block pattern is somewhat similar but includes four T shapes within its borders. Read all pattern instructions before you cut the fabrics. Alter cutting if you use a different method to create half square triangle units for the blocks. Cutting is for units sewn in pairs. If you plan to make lots of identical half-square triangle units, you might prefer to use the Magic 8 method for their assembly. We prefer to cut oversize squares to assemble most half-square triangle units and then trim the units back to the perfect size after assembly. 12" Block - completed units should measure 8-1/2" x 8-1/2"
6" Block - completed units should measure 4-1/2" x 4-1/2"
3" Block - completed units should measure 2-1/2" x 2-1/2"
12" Block - completed units should measure 4-1/2" x 4-1/2"
6" Block - completed units should measure 2-1/2" x 2-1/2"
3" Block - completed units should measure 1-1/2" x 1-1/2"
Combine four more small background squares with four T-squares to make a total of ten smaller half square triangle units. Refer to the drawing above. Use a 1/4" seam allowance. Sew two smaller half square triangle units together in a vertical column as shown upper left. Press seam allowance towards the darker fabric. Sew the vertical column to the side of a larger half square triangle unit. The T fabrics should touch as shown. Press seam allowance towards the larger triangle unit. 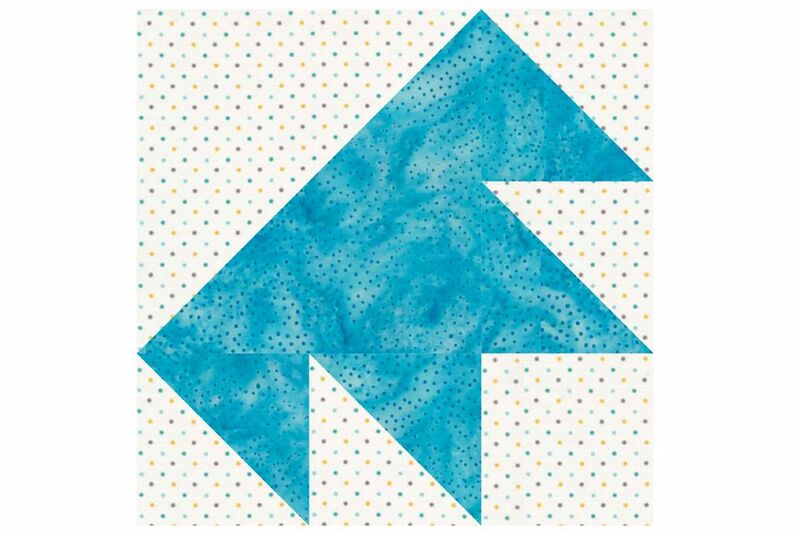 Sew three smaller half square triangle units into a horizontal row as shown above under the unit created in Step 2. Press seam allowances towards the right. Sew the Step 3 unit to the bottom of the Step 2 unit, matching edges and seam intersections. Repeat to make a second quilt block. Press the quilt block. The 12" finished block should measure 12-1/2" square; the 6" finished block should measure 6-1/2" square; the 3" finished block should measure 3-1/2" square. If your block is smaller than it should be, or skewed, then press again and recheck. If it still isn't quite right, use this easy squaring-up method before sewing it to other blocks. T Quilt blocks can be arranged in many ways. This is one example of a scrappy layout.